Midsummer, also known as Litha, was celebrated on Saturday, June 20, 2015 at 8pm. The sun was setting in the west, but plenty of light abound as the longest day of the year doesn’t see a sun set till 9:30 pm. The ritual began with the song “Midsummer” by Heather Alexander. The Gods and Goddesses were honored as Midsummer poetry was read. Each person set a goal to accomplish by Lughnasadh. The Holly King overtook the Oak King as the ruler of the next six months. This is because the sun reaches its zenith on Midsummer. Thus the power of the Oak King grew strong as all life returned after Yule. Now, as the days grow shorter and nights longer, life will peak and then begin to wane before dying and going to sleep during winter. This is the period of rule of the Holly King and natural dominance over the Oak King at Summer Solstice. The inverse is true at Yule, when the Oak King takes over to rule again. Offerings included strawberry lemonade and fruits of the season. All were blessed of the Gods and feasted on bratwurst by a Midsummer fire. Sad news to report, one of the local gay bars of South Salt Lake, The Paper Moon, located on 3737 S State, closed its doors this past December 2014. SLPS was informed about its closure in April 2015, which appeared to be quiet and unnoticed in the community. Its website, thepapermoonclub.com says “This webpage is not available”, but there is still a Facebook page. Yelp, a popular customer venue rating site like Urban Spoon and Angie’s List, also reports of its closure. As the only lesbian bar in Salt Lake City and the only gay bar located out of the downtown area, this is a great loss to the culture and night life of the LGBT community. The Goddess and God united in love and became one for the day! The Great Day of Beltane, when the God and Goddess come together for their wedding ceremony and to make new life that will be born at Yule. The ceremony was held outside on a beautiful Sunday afternoon, May 3, 2015 at 3pm. The altar was decorated with Celtic knot work items and plaques of the Goddess and God and of the God and God for Queer mysteries. A lesson on the meaning and origin of Beltane took place, and the offerings were white wine and strawberry short cake. The feastings later in the evening were Italian sausage spaghetti, green salad, and garlic bread with red wine. 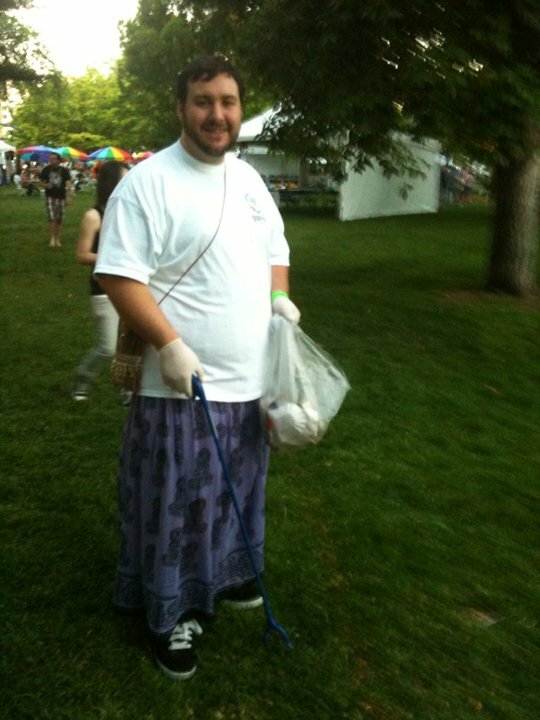 Salt Lake AIDS Walk 2014-Pure Activism! Everyone enjoyed a sunny morning on Saturday, September 20, 2014 at 9:30 at the City Creek Center. Surprises all around that the event was held there (City Creek being invested by the LDS Church) quickly changed into excitement as the Cheer Salt Lake team pumped everyone up for the 2.5k walk around down town SLC. A few furry friends were even in attendance. The walk started off at the Food Court and ended at the Harmons on 100 S and State. The fundraising for Utah AIDS programming was the critical component for the walk, to raise awareness about the need for funds and to reach the $60,000 goal set by the Utah AIDS Foundation. Teams from various organizations and companies such as Ebay and American Express, as well as the Royal Court of Utah and SLPS walked along side individuals, couples, and children. This past weekend has been a very busy but successful one for SLPS! Things kicked off on Thursday, June 5, 2014 at 7pm with the Utah Pride Interfaith Coalition’s Interfaith service at Wasatch Presbyterian church. SLPS adviser April love read the “Who is Pagan” remark, quoting the Charge of the Star Goddess by Ann Moura and President Muad’Dib gave a five minute discussion that all people are deserving of unconditional love, all are divine, and that everyone can have a one-on-one with the divine. The Salt Lake Men’s Choir sang and faith leaders from Native American, Pagan, Jewish, Muslim, Sikh, Metaphysical, Tibetan and Zen Buddhist and Christian faiths were present, with the pews full to the brim. Many hearts were full as Moudi Sbeity spoke about the Marriage fight in Utah as it began with him and two other couples who sued the state for equal rights. Saturday, June 7, 2014 at 2pm was an interfaith rally that joined with the Dyke and Trans rallys and marches down from 200 S and 200 E to the festival at Washington Square at the Salt Lake City and County Building. 3pm brought the start of readings for $5. Lei Loni Tilley and Janelle Baguley joined SLPS in full mermaid attire. Lei Loni read the cards at the booth entrance, drawing in all the mermaid/mermen to be! The close of the day came at 9pm when the sun set and SLPS headed off to have a late dinner of Pakistani food at Zaika on State street. Sunday, June 8, 2014 was the Pride parade at 10am. Lined up at 400 S and 400 E in the back with the interfaith, SLPS marched in robes and pointy hats, with The Mermaids of the Great Salt Lake. President Muad’Dib sported a new custom rainbow outfit made by Woman Between the Wolves. The parade finished around 12pm and the readings continued, picking up an even greater pace of people the second day till the festival closed at 7pm. The festival was very successful for SLPS, making back the booth fee and having enough to spend on a celebratory dinner at the Rio Grande Cafe and give some back to the tarot readers. Here is to next year’s pride! SLPS had a wonderful time reading tarot for all the dancers at the 12th Annual Springfest- Bellydance Festival by Thia on Saturday, March 2, 2013. Held every spring at the Utah State Fair Grounds, it’s a full day of dance, shows, vendors, food, and great music. As the evening goes on, the music get’s louder, since the better troupes and shows wait to dance in the evening. SLPS stayed till around 8pm before heading out. Many folks received spiritual advice and healing messages from the tarot. This year has showered man opportunities among us in the LGBTQ community. 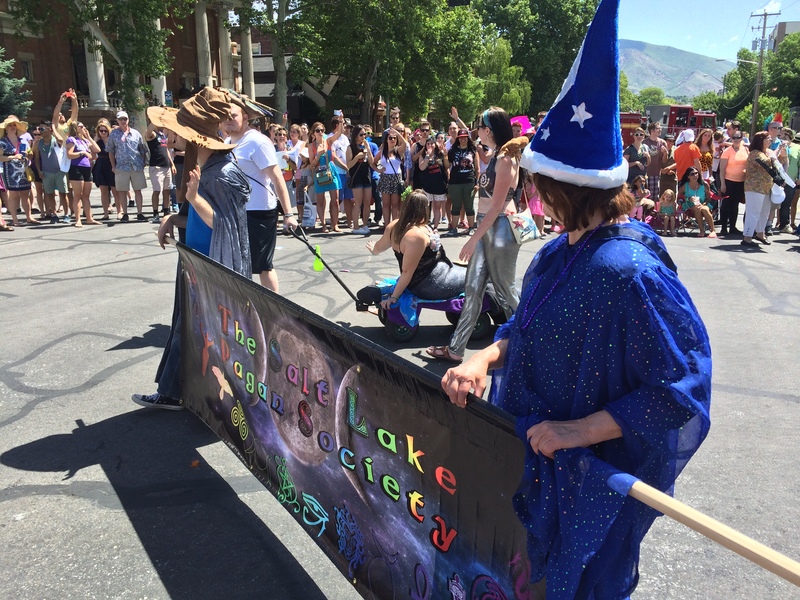 As a member of the Utah Pride Interfaith Coalition, we are allowed to march in the Sunday morning parade! Come dressed in robes, hats and staffs and be ready to carry our banner. We need people who can march to come and hold the banner, three people would be nice! Each person will need to purchase a ticket at the gate even though they will be vending. The festival has made no except and since we are in the Grass Roots Zone, we only got three free tickets. Please come and support us in our endeavor to bring education, awareness and inclusion to the people of Utah. Look for our ad in the LGBTQ Newspaper the Q Salt Lake! 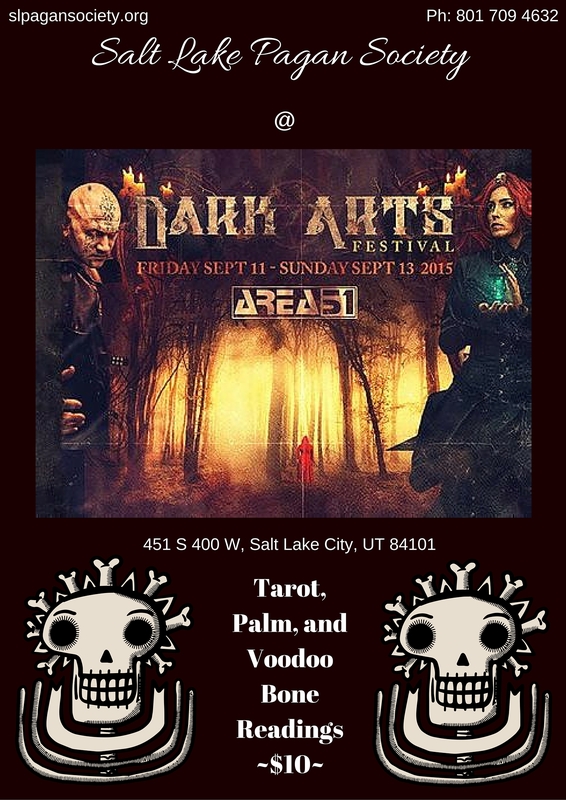 As SLPPD nears us, its time to get the word out that UUPS will be tabling with their sister group Utah State University Pagan Alliance. 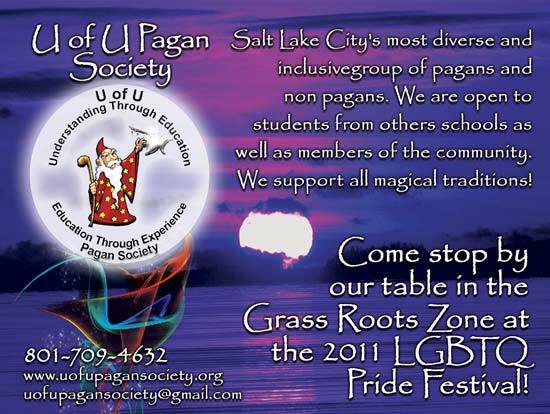 Please come check us out and enjoy the company of the other local pagan college students. Look for our banner. We will be tabling the whole day, so stop by and say hello, and get a brochure or two!